What is a Make Day? Make Day Juliett was one of many "Make" days that OfferZen is offering to local developers around South Africa. 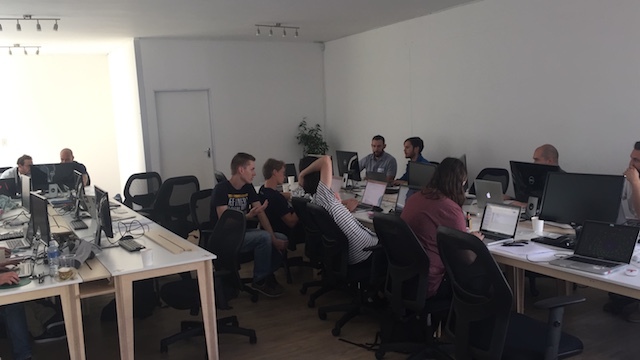 OfferZen is hosting 20 developers per Make day to join in a full day of building things (hence the name) in a low-pressure environment that is focused on learning. You can find more details about OfferZen's Make platform here. What is Make Day Juliett? If you want to find out more about the day then just look at this PDF which explains all about the Make Day and Root's insurance platform. 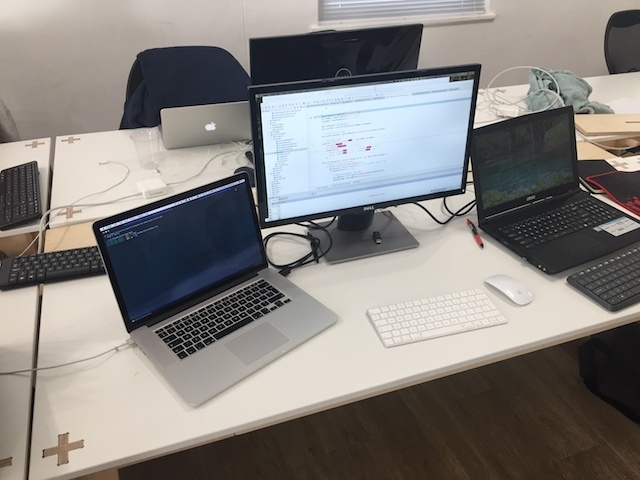 of finding out about DialogFlow and Root, setting up our Root API accounts and making a request to the Root API. about DialogFlow and Root insurance, not struggle getting my first intent setup or anything mundane. the make day was very appealing to me as I am quite interested in ChatBots (as you can tell from my other blog posts). or interest was a great idea. In terms of who was there, there were developers of all skill levels which was refreshing. There was namely CTO's, juniors, fresh graduates, developers, senior developers so the group was very diverse and this allowed for new perspectives and ideas. After the meet and greet and breakfast, the event officially started, we all gathered in the Make Space and OfferZen presented various talks on what we would be building. We had a talk on what Make Days are about and what the platform wanted us to gain as software developers. deadlines and finishing the product which offers little flexibility for learning something new when you are expected to be knowledgeable and perform well. 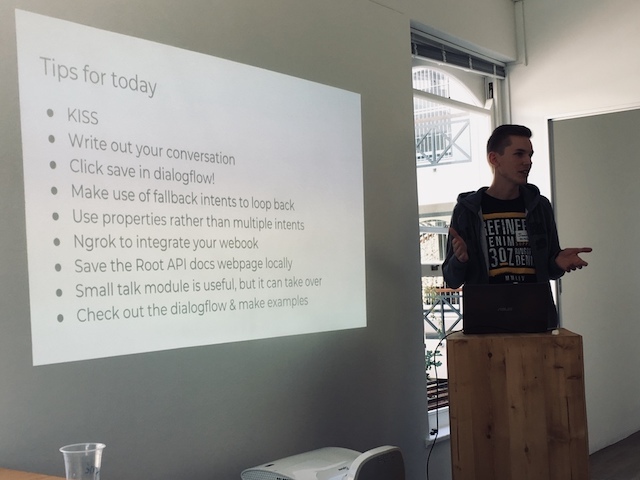 around DialogFlow was not shallow so this presentation helped a lot in terms of the basics and getting to know about intents, entities and actions. for more time to do as the event suggested, "Make" things! with different people of different languages. 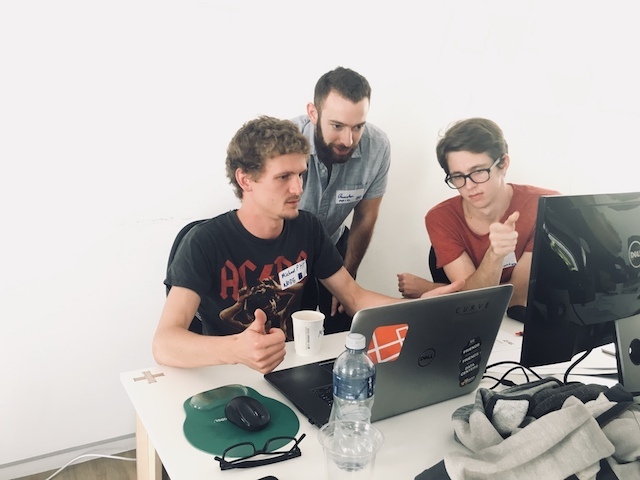 A 3-person team even teamed up and decided to do the project in a new language altogether, I decided not to opt for this approach as I was more interested in learning about DialogFlow. 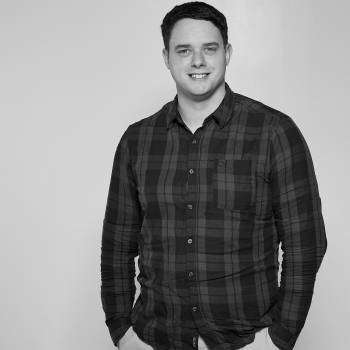 I teamed up with another developer who also opted to use PHP for the project. The teaming up process was easy and within 30 minutes, we were all at our stations and ready to go! Make developers hard at work! actual job of recognizing user input and then sending an event to our BotMan app. way of learning new things. My team-mate and I continuously bounced ideas back and forth and reflected on how best to solve a problem or architect the application. they not only offered guidance but also some suggestions for the projects. when building software with that service in a time-span of one day. great progress or ended up focusing on one portion and learnt a lot there. What tech stack did we go with and what was our idea? What did we learn from the Make Day and would we come back? What was missing from the Make Day & what could be improved upon? and secondly, it removed the element of competition from the Make day as there was going to be no judging of your application at the end of the day. What did I learn from the Make Day? leverage DialogFlow in my future chatbot applications. I also learnt a lot about the Root API which was a really cool experience as the Root API was very easy to work with and the documentation was incredible! 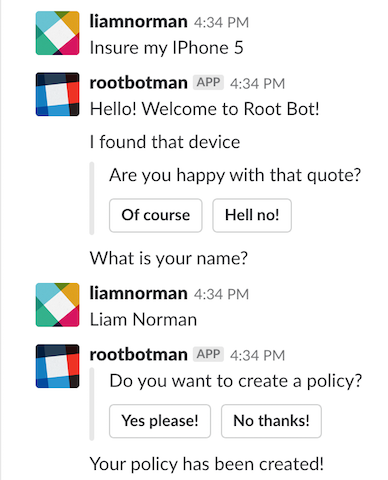 I went from 0 experience in the API to allowing a Slack user to insure their cellphone! In conclusion, I found the Make day to be a refreshing way to learn new things especially with other people rather than sitting down at a desk and reading a book. a very beneficial element of the day as it allowed for continuous feedback and new ideas when creating the application, after all, two pairs of eyes are better than one. I'd definitely be back for another!